Oil paint is a medium, that when used properly can have beautiful results. It has been used for hundreds of years by many famous artists that are today considered masters. Picasso, Rembrandt, Pollock, Carravaggio, Reubens, Monet, and Van Gogh have all worked with oils. While a lot of time has passed since it was first invented, its basic composition has not. Because of this there are some basic steps that you can follow to insure that your painting lasts as long as possible. The first step to creating a stable painting is starting with a stable base. This involves sizing the canvas and applying a ground. WHAT IS SIZING A CANVAS? Sizing a canvas applies a liquid that soaks into the canvas fibres and seals them. This prevents the oil paint from soaking into and damaging the canvas. This is because the linseed oil used in traditional oil paint contains linolenic acid. This acid can soak into the fibres of the canvas and damage them over time. It can also help to prevent support induced discolouration. This is when the wood or canvas itself can be absorbed into the oil paint and cause discolouration. Areas that have transparent applications of colour like glazes are especially susceptible to SID. A high quality sizing medium like Golden GAC 100, can help to eliminate these issues. Traditionally rabbit skin glue was used as the sizing for oil paintings on canvas. Rabbit skin glue is made by boiling the connective tissue from rabbits. The refined “glue” is made into a powder or chunk. Artists would then add water to the glue and heat it. The subsequent mixture would be applied to the canvas. Rabbit skin glue is not used as much today partly due to the emergence of synthetic alternatives. Rabbit skin glue also has the downside of absorbing water from the air. This causes it to shrink and expand. The shrinking and expansion over time can cause problems with subsequent layers of oil paint. The paint can crack or flake off due to the movement of the canvas beneath it. More recently oil painters began using a PVA size on their canvas. PVA stands for polyvinyl alcohol. A PVA size provides the same sealing properties as rabbit skin glue (RSG). Its advantage is that is doesn’t tent to absorb moisture from the environment as much as RSG. This reduces the chances of the paint cracking or delaminating. 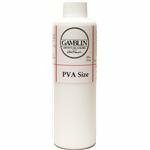 Gamblin makes a PVA sizing that is suitable for this use. The third option is an acrylic polymer medium. Polymer mediums like Golden GAC 100 can effectively block penetration of oil paint into canvas fires–especially if two coats are used. One disadvantage to using a PVA or polymer based sizing is that they don’t have the tightening properties of rabbit skin glue. Rabbit skin glue shrinks as it dries which pulls the canvas tighter on the stretcher. This makes for a stiffer support to paint on. There are products like Golden’s GAC 400 that are designed for stiffening fabric. 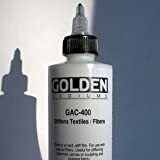 If used according to Golden in conjunction with GAC 100, the GAC 400 can provide a stiffening of the Canvas. A round is an opaque, usually white, coating that is applied over the size on a canvas. The bright white colour of the ground provides a surface for light to reflect on. This means that the colours of an oil painting can appear more vivid. This is because light is able to pass through the layers of acrylic paint and glazes. It then reflects off of the white ground and back out of the painting. This effect can be made even more apparent by using more transparent oil glazes. This is because the layers of glazes allow more paint to penetrate to the ground and bounce back. Early painters relied extensively on this technique. To achieve many of their lighter colours where transparent layers of glazes, rather then adding white pigment directly to the layers of paint. Grounds also serve to help with mechanical adhesion of the oil paint to the surface. They often include materials that make it easier for oil paint to bond to. Initially oil painters worked mostly on wood panels. They used a gesso ground made from chalk and glue. 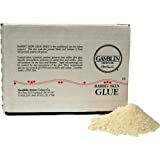 This was very effective on works on wood, but it is not as effective for oil painting on canvas. This is because the glue and chalk mixture can be somewhat brittle. As canvas naturally tends to flex and move it can be susceptible to cracking. For this reason artists working on canvas would use a gesso with added linseed oil, which made it more flexible. Today there are several options for artists working with oils on canvas. Acrylic Gesso can be used as a ground for multiple different types of paint including oils. The downside to using an acrylic gesso is that it remains more flexible then oils in its dried state. This difference in flexibility can cause issues like cracking down the road. 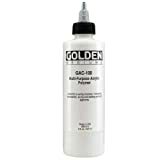 Golden suggests using acrylic grounds for oil paint only if you are working on a rigid surface (like a wooden panel, a canvas stretched over a panel, or a canvas laminated to a panel. 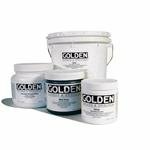 Golden Artist Paints makes a very high quality acrylic Gesso. Specialized Oil Grounds are the traditional choice. They usually combine an oil (like linseed oil), a white pigment, and other minerals that can help the oil paint bind to the ground. 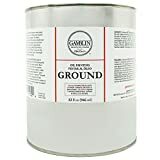 Gamblin makes a high quality oil ground. If you are not using pre-stretched canvas, then stretch the canvas on a wooden stretcher. It can also be laminated to or stretched over a wood, or Alum-a-bond panel. Cotton or Linen canvas can be used. Follow the manufacturers directions, and apply the sizing liquid to the canvas. If you are using an oil ground over an acrylic sizing you should wait up to a week to ensure that the sizing is thoroughly dry. If you are using an acrylic ground then you can apply it as soon as the acrylic sizing is touch dry. Follow the manufacturers directions. **NOTE: You should not use an acrylic ground (acrylic gesso) over a rabbit skin glue sizing. Follow the manufacturers directions for application. Oil grounds can be applied with a brush, but can also be applied with a wide palette knife. If you used an acrylic sizing in ground, you should wait at least a week or two, to ensure that it is thoroughly dry. This is to ensure that there is no residual water left in the acrylic medium.